Tucked away in the commercial expanse and generic, concrete apartment buildings that populate the corner of Prince of Wales and Meadowlands, lies a food truck. 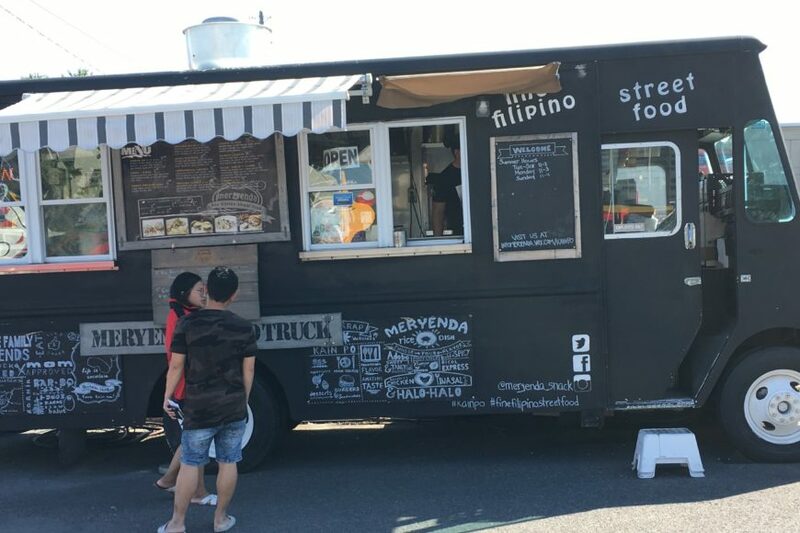 But it isn’t just any food truck or chip wagon selling the same old burgers and poutines, it’s Meryenda, a Filipino-style truck. 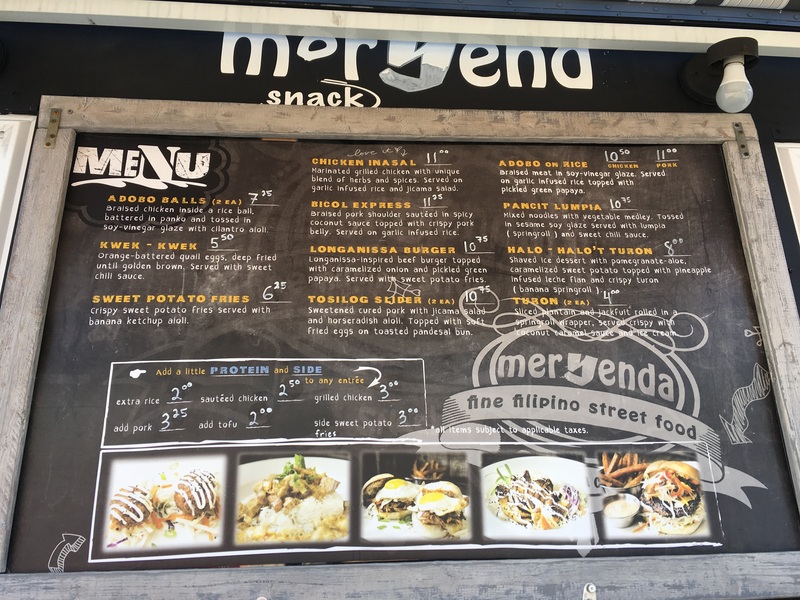 Meryenda has taken traditional Filipino dishes like chicken adobo, longanissa and tosilog and given them a more contemporary twist and a more street-food-friendly format. Think chicken adobo arancini, tosilog sliders, and a longanissa burger. Don’t worry, traditional Filipino food lovers, you can still get a big ol’ container of chicken adobo on rice, or even halo halo (the quirky Frankenstein-of-a-dessert that is beloved in the Philippines). Their menu sang a song to me of flavours and meats that made me want to have it all, but sadly I was just one man. A very hungry man, but still just one solo stomach. Wanting to try as much as I could, I pushed the boundaries of what would be suggestible for a meal for one lone person. Having arrived mid-afternoon, there wasn’t much of a line-up, and my food was soon ready and I set up shop at one of their picnic tables. While the arancini and sliders were in clam-shell containers in a bag, the halo halo was in full sight, and what a sight. A three- to four-cup container (!!!) 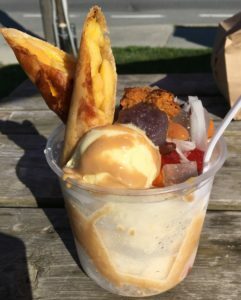 was filled with shaved ice, pomegranate aloe, caramelized sweet potato, pineapple-infused leche flan, and had two halves of a turon (plantain and jackfruit spring roll) sticking out of the top. FYI, those were just the ingredients listed on their menu! There was also a sprinkling of black beans, possible coconut meat strands, and colourful cubes that while reminiscent of the awful dried fruit in your aunt’s awful Christmas fruitcake, were much better than that. The dizzying amount of colours, flavours, and textures are part of halo halo’s appeal, and it just works. The Meryenda guys know their egg presentation because opening the tosilog slider container and seeing the soft, orange-y yellow yolks was a sight to behold. The tosilog (sweetened and cured pork) was pulled, and while sweet, didn’t have as much of a salty or tangy side that I would have hoped for to balance things out. 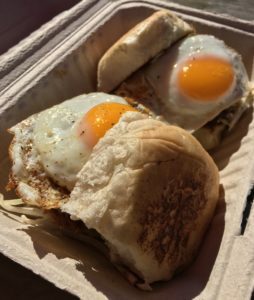 Nonetheless, the runny yolks, crunchy jicama slaw, and wonderfully soft buns made for great little sandwiches. 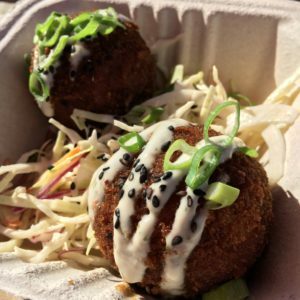 The adobo arancini were equally pretty to look at – fried golden brown, with a drizzle of cilantro aioli and sprinkling of green onion and black sesame seeds, these could have been on the plate at any of the latest hip restaurants. I was disappointed that their soy and vinegar glaze took away the crunch of the panko breading and textural contrast between the fried exterior and rice interior, but the flavour was totally on point. Soy, vinegar, garlic, and likely many other ingredients made up the adobo flavourings here as they do in Filipino kitchens around the world. While the execution wasn’t quite perfection, I loved my food at Meryenda. From the flavours that they bring, to a style that is all the more unique in a city where Filipino food isn’t exactly a known element, there’s nearly as much to celebrate about Meryenda as there is things I want to eat on their menu.